Our Client has been on the market since about 50 years and is one of the most important protagonists of the Italian dairy industry. The business of this Group consists of 4 main areas: milk and cream, yogurt, cheese and “diversification”, which includes industrial gastronomic specialities, eggs and desserts. Milk still remains his primary activity, even if, with the acquisition of another group, his business portfolio has had a great growth of the yogurt and cheese section. The Client operates through 7 production facilities, spread all over the Italian territory, that are provided with certified quality and environmental management systems. Besides the refurbishment of the plant, the client’s main need was to face a considerable increase of the flowrate of the wastewater to be treated, having a COD inlet value of 3000 mg/l, and redoubling the capacity of the existing plant. Thanks to the long experience and to the wide knowledge of the dairy sector production cycle, VWS Italia supplied a turnkey water treatment plant made up of a “water line” and a “sludge line”, allowing the treatment of 3000 mc/day. This case study has the purpose to show the application and the results obtained by the IDRAFLOT® unit installed within the plant. 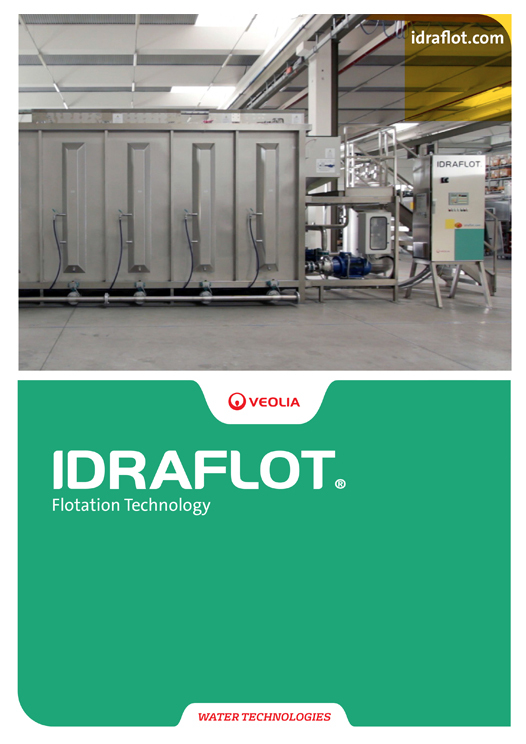 Within the supplied plant, the flotation is carried out through an IDRAFLOT® unit type IFS 120 focused on reducing the levels of fats, oil, grease and suspended solids content from the wastewater to suitable levels, which would otherwise have a detrimental effect on the biological treatment system. Flotation DAF is a process using air dissolved in water in order to achieve solid/liquid separation. In order to increase the process efficiency, chemical additives are normally dosed. Coagulation followed by flocculation inside the treated fluid is achieved. Coagulation is meant to destabilize solid particles in stable equilibrium inside the fluid, while flocculation is meant to gather the particles into bigger and more extended flocks.